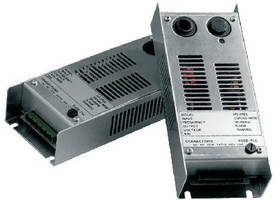 Regulated AC-DC Converters provide 50 W output capability. Available with input voltage of 115 or 230 Vac, B Series includes 12 models that provide fixed outputs of 1–12 kV at 4, 20, 30, or 50 W of output power. AC line operated, chassis-mount units include indefinite output short-circuit protection and output arc protection as well as fault monitor with isolated relay contacts and fixed-frequency design. Applications include bias supplies, isolation testers, electrostatics, air ionization, ozone generators, UV lamps, and capacitor charging. RONKONKOMA, New York – UltraVolt, Inc., a world-leading manufacturer of high-voltage power supplies and high-voltage power systems, announced today the launch of its newest line of single output high-voltage modules – the B Series. The new line of “Basic” performance AC-DC high-voltage modules, the B Series, consists of 12 models that provide fixed outputs of 1kV to 12kV at 4, 20, 30, or 50 watts of output power. B Series units are available with an input voltage of either 115VAC or 230VAC. The B Series is less expensive than a two-module AC to DC and DC to DC module solution, making the series ideal for lower cost capital-equipment applications. Features on the new line include indefinite output short-circuit protection and output arc protection. Other features include a fault monitor with isolated relay contacts and a fixed-frequency, low-stored-energy design. These modules are UL, cUL, IEC-60950-1, and Demko Recognized. The B Series of high-voltage regulated AC-DC converters addresses the need for an AC line operated, fully integrated, chassis-mount fixed-output regulated high-voltage power supply with nominal performance and limited functions. These modules are designed and built utilizing state-of-the-art power-conversion topology. B Series units feature design, manufacturing process, and encapsulation techniques that provide high reliability. Typical B Series applications include bias supplies, isolation testers, electrostatics, air ionization, air & oil precipitators, ozone generators, UV lamps, capacitor charging, and flash lamps. Download the B Series datasheet for more information. UltraVolt, Inc. is a world-leading manufacturer of a comprehensive range of standard-product high-voltage power supplies and systems. UltraVolt offers world-class support to customers searching for high-voltage power supplies with short lead times and nominal to high performance for efficiency, accuracy, stability, and ripple. UltraVolt product lines range from benchtop and rackmount systems to microsize PCB-mount modules with outputs of 0 to 62V through 0 to 40kV at 0 to 100mW to 15kW. Founded in 1990, the company is based in Ronkonkoma, NY. For more information, call +1 (631) 471-4444 or visit http://www.ultravolt.com.